Bok choi, much like ginger, is one of my favorite foods except I find myself often forgetting that because for some odd reason this incredibly easy to make ingredient I perceive as such a hassle. I wonder what's broken in my mind to think such a thing about such a simple recipe. I also find myself googling the instructions EVERY TIME I make it! What's up with that? Well I follow the recipe from Stemay Kitchen. I seem unable to copy the copy link. 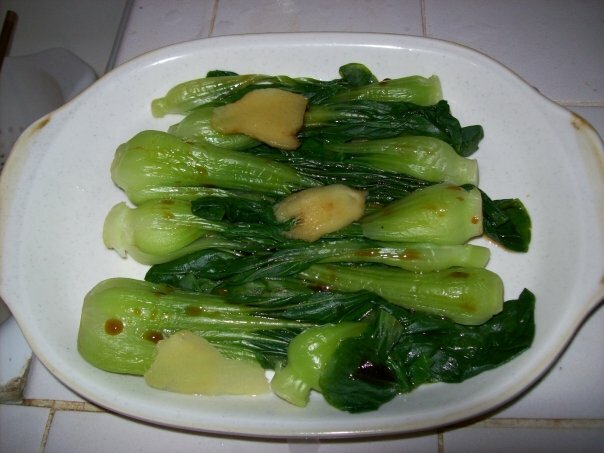 I found it by googling how to cook bok choi and clicked on the steamkitchen.com link. You can do the same if you'd like to view the original recipe, which I recommend because there are pictures. It'll make following those instructions far more appealing than mine. 1) Wash the bok choi as dirt can be imbedded in the root. Remove any damaged outer leaves and cut off the ends. That'll make cleaning the bok choi much easier, too. 2) Over medium high heat, add extra-virgin olive oil to lightly coat the pan. Then add minced garlic and ginger. I used a microplane and threw in the amount I desired. You basically want it to slightly cover the pan. Then again I flavor heavily with garlic and ginger. So adjust it to your preference. 3) I cook the garlic and ginger until it becomes aromatic, and the garlic becomes slightly translucent. I don't wait until the garlic lightly browns because by then I feel like I move too quickly and everything burns. If you feel that way, don't wait until it gets to that point. When you add the water and put a lid over the pan, it'll cook adequately. 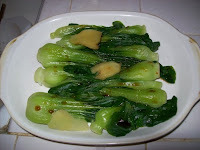 4) Coat the bok choi in the garlic ginger sauce. I did this for about two minutes, but apparently you're just supposed to immediately add 3 tbsp water or chicken stock. Cover right away for a few minutes until water evaporates. The original recipe calls for covering it only a minute before you can enjoy this dish. Drizzle with sesame oil and salt to taste. (Sometimes I don't add the sesame oil if I want the ginger flavor to dominate). 1) I'm always open and willing to try new foods that I don't think people realize that I can be picky. I definitely have a standard for quality food and dislike poor quality. But as an adult, I surround myself with other foodies, so few have seen me unhappy with my meals since we all enjoy quality food. With that said, I'm not a fan of onions and bell peppers. I'm now able to "omit" the flavor in my mind and appreciate the dish. But I used to be unable to enjoy the dish when I could taste the onion, which is virtually in everything. I was so picky that I used to make own chicken stock without onions. I ate the food, however because I thought it'd be disrespectful to refuse and waste the food that people don't realize how much I despise it! 2) I really have tried to give onions a chance. I've had them raw, grated, sliced, pickled, broiled, glazed, roasted, in soups, sauteed, blended, in sauces and dressings, dried, poached, steamed, etc. I just don't like them!!! 3) I love farmer's markets! I've been described as the farmer's market diva and interestingly enough I attract vendors from markets in my personal life whether it be that I develop a friendship with them or meet them at parties. It's such a trip! Not every vendor is honest and there's certainly shadiness that goes on in there. It's astounding how many consumers are oblivious to the deceit around them. They consider the farmer's markets to be a haven of such dishonesty, unlike corporations, but the truth is lies exist everywhere. I'm fortunate to have more insights. I've even picked the produce at some of the vendor's farms! 4) My friend describes me as the Traveling Cook because I live in a bachelor. That's basically a studio without a kitchen, so I travel to my friends' houses and cook there. 6) I've never milked a cow and I really want to. I'd love to ry fresh milk. 8) My favorite comfort foods are creamy mac and cheese (the cheap version - I love the fancy stuff with white cheddar but not for comfort food) and creamy tomato soup. 9) I started a container garden collection. I have tomatoes, shiso leaves, parsley, oregano, peppermint, Italian and Thai basil, and wild arugula. Please go to this website and view the slideshow on how to sprout your own beans. It's surprisingly easy and your body will appreciate your efforts, as this method makes them more easily digestible. Although I do want to give a disclaimer because sprouting beans have become all the rage nowadays, but keep in mind that every person is different. This is probably the best way to have beans, however not everyone is well suited for beans. For example, my yoga instructor is an unfavorable candidate. According to Chinese medicine, she's recommended to stay away from beans due to some internal state. I can't remember what the details anymore. My point is that if you try them and find that your body doesn't agree to it, don't eat it. I enjoy cauliflowers but for some reason it's not something I eat regularly. When I came across one, I wanted to roast it because roasting vegetables is probably my favorite way to enjoy many of them. Plus I've never tried them roasted before. It's delightfully delicious. 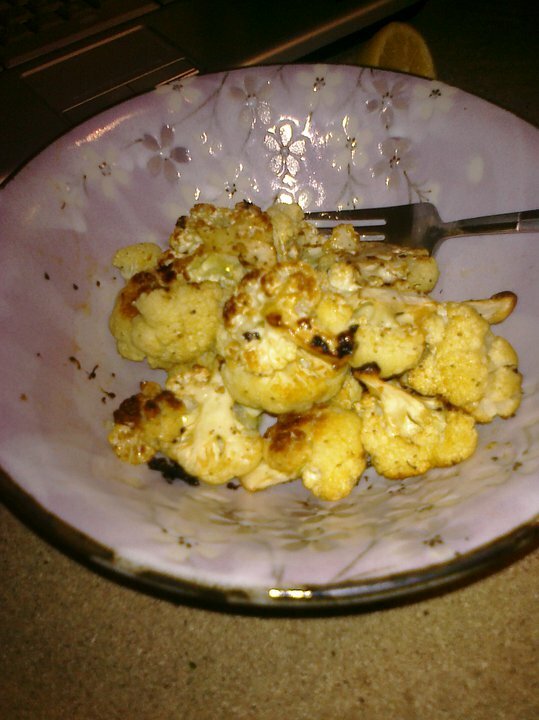 It tastes like cauliflower but better. And this recipe was beautifully lemony. It's a great addition to many dishes but I ate them by itself. Since it's insanely easy to make, it's a recipe I think everyone should know. It's the ideal go to side dish. Preheat the oven to 400 degrees F. Cut the cauliflower into florets and place it in a single layer in an oven proof baking dish. I mince garlic effortlessly by grating peeled garlic right over the dish. It works wonders! 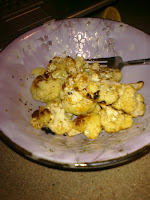 Drizzle extra-virgin olive and lemon juice over cauliflower. Salt and pepper to taste. Roast for 25-30 minutes or until the top is lightly browned. It tastes better when it's slightly darkened. Test with a fork for desired doneness. It should pierce the skin easily. The original recipe called for parmesan cheese which I didn't have and I'm personally glad I didn't because I feel like that would've distracted from the beautifully harmonious lemon flavor infuse in the cauliflower. Actually the key to make this amazing is to add lemon juice again right before serving. And of course it should be served warm. I ate it up so quickly that I have no idea how it would taste the next day, but I really recommend squeezing a little more lemon juice at the end. The amount of lemon juice used while roasting wasn't satisfying enough for me. But this is obviously a very versatile recipe, so make it your own! My friend had weekly potlucks and many of them had very specific diets (no dairy, no meat, no fish, vegans, vegetarians, etc). I suppose that financially-detrimental work experience at that vegan company became more than my realization of how gullible I can be around con artists (not exactly uncommon but still....) and became training for foodies with diets I was never able to relate to before. 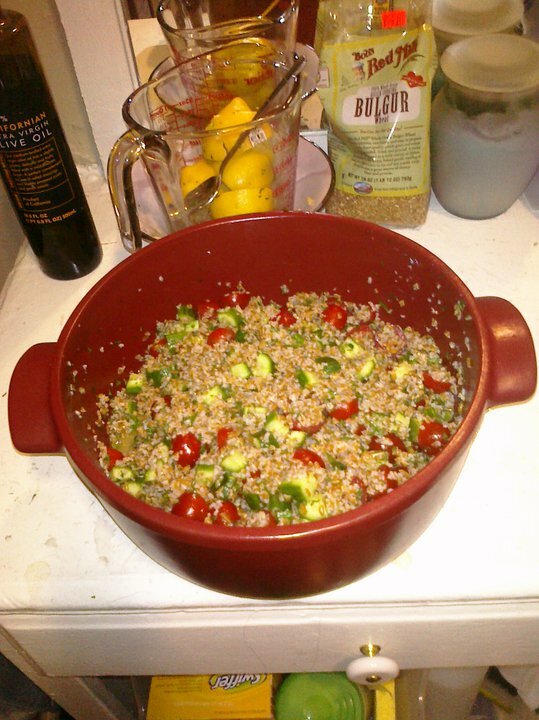 I became really good at making crowd pleaser meals beginning with Americanized tabbouleh. I feel inclined to make that clear because my friend fbed me that my tabbouleh was so unauthentic that it's an entirely new dish. True but then again we're American. So maybe it's American authentic? I uonno...I also don't care. I got this off of the Food Network from Barefoot Contessa. I know I deviated from the proportions slightly but I'm not exactly sure by how much. The original recipe is all that I can reference and a good template to follow. You can always experiment, deviate, or harness your culinary intuition if you feel fit. Boil water in a pot. Pour in the bulghur wheat. Stir, then leave it to "cook" at room temperature for about 1 hour. Add the mint, parsley, cucumber, tomatoes, salt, and pepper to taste. Mix well. I added a little extra virgin olive oil until the texture seemed appropriate. Since I was already running ridiculously behind, I transferred this into those clear plastic bags that you use to fill produce at the supermarkets and dashed off. I didn't add lemon until I arrived to the potluck many many hours later and everyone absolutely loved it! I've been looking at my red lentils which takes far less time to cook and bulghur wheat which only requires water for quite some time now. I decided it's no longer acceptable to look at such easy ingredients to work with and feel overwhelmed and uninterested at the notion of using them as my hunger churns my stomach. So I finally went online and found a recipe that I modified to a heartier version because once I began cooking, I just wanted to add more and more. 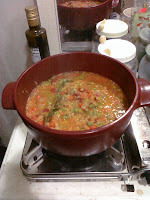 I got the original recipe from http://www.harnessyourkimchi.com/2009/12/recipe-red-lentil-and-bulgar-wheat-soup.html. You should check the site out. There's some great recipes and the blogger's quirky which I appreciate it. Since I was still in my lazy mood and wanted the cooking to be done as quickly as possible, I used a lot of canned goods for this recipe. I still found it to be yummy. You can, of course, use fresh ingredients and alter the cooking time. But this is a great choice for those cold winter nights when you'd rather not do anything, yet crave the benefits of something warm and satisfying. I used however much water I felt was right and my soup came out thicker than thinner but experiment! I believe I heated extra-virgin olive oil in a pot and coated the red lentils with it. Then I added water into it. I wanna say enough to slightly cover the lentils but not insanely. I'm sorry I barely remember the recipe. I hope anyone reading this is already familiar with how to cook red lentils. It takes far less time to cook which is why I chose to buy the red ones, anywhere from 20-25 minutes. You want it to boil and then keep it at a simmer. Once they seemed "ready" or neared ready, I added the tomatoes, seasoning, and the bulghur wheat. When the bulghur wheat puffed and looked different, I threw in the carrots and peas which was near the end. Basically enough to heat it threw. It was during that time that I added garlic and ginger. I just grate it which is beautifully effortless! I also threw in the rosemary sprig. I let it simmer for a bit. Then I adjusted the seasoning to taste. The lemon finished it off beautifully. I did that at the end and added an extra squeeze to every bowl I enjoyed. At the end I removed the intact rosemary sprig for easy clean up. I get to enjoy the flavor of rosemary without the woodsy texture I dislike. Yay! Shame On Me and My Posting Negligence! It's unacceptable that I haven't found the time to post any new recipes for over two years!!!! I'm taking the time to apologize and to assure you that while I can't do it today, I'm going to return very soon to post many recipes I've made! Luckily my cooking habits haven't been as neglectful. I've been on a total salad frenzy since I've moved into a bachelor which is essentially a studio without a kitchen. I purchased a toaster oven and a portable stove top. The limitation and my budget has encouraged me to become more creative and experimental. I find it satisfying and eye-opening. With the summer coming up and all sorts of great produce, I've gravitated towards elaborate salads which I'll be more than happy to post. It's like I opened my eyes for the first time, and I'm just trying to take everything in. So I can better understand the world and my place in it.